Sweden is counting down to elections in 10 days from now. The rightwing party Sweden Democrats, who are calling for a so-called Swexit (Swedish Exit from the EU) and want to put a stop on any immigration into the country is riding high in the polls and looks set to take close to 20% of the votes. A splinter group of this party called the Alternative for Sweden (AFS), held an election rally in Uddevalla on Thursday afternoon and was assaulted by a group (who did not look very blond with blue eyes) during their presentation on the town’s square. The conflict started when left-wing extremists and non-European immigrants attacked them as they were presenting their election program. 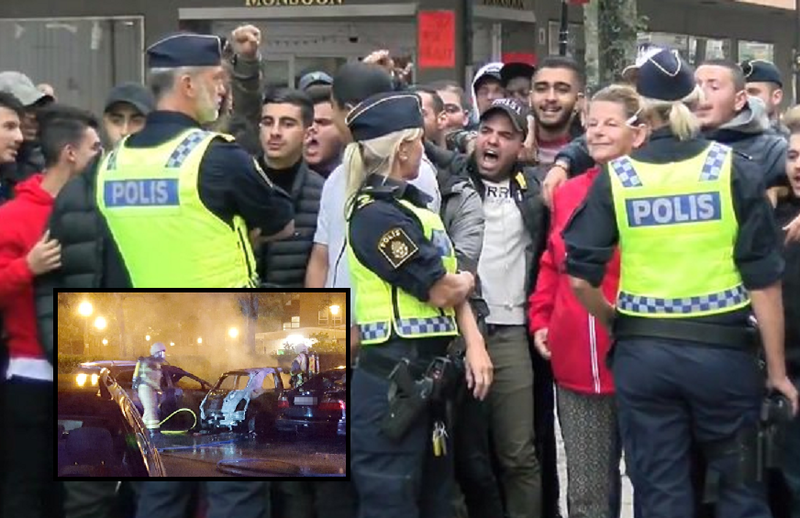 Parliamentary candidate Mr. Markus Jonsson of the Alternative for Sweden (AFS) explained what happened: "I tried to protect my friend and colleague and that immigrant started hitting both of us in the face." He went on to say that the crowd chased a car belonging to AfS for some time. "When we stopped at the red light, they kicked the car." Immigration and crime have taken center stage in the Swedish elections this year. Whereas speaking against immigration was seen as ‘not done’ in the past few years, parties like the Sweden Democrats and the Alternative for Sweden have brought the issue to the foreground. Related coverage: <a href="https://thegoldwater.com/news/35172-Sweden-Guardian-Admits-Steve-Bannon-s-Favourite-Party-Will-Top-Elections"> Sweden – Guardian Admits ‘Steve Bannon’s Favourite Party’ Will Top Elections</a>. Furthermore, the arson attacks where masked youth groups can be seen burning random cars also continue. Last night, there were several cars burned on Slåttervägen in Trollhättan. The alarm went off just before three o'clock on Friday, and when police and rescue services came to the scene, four cars were completely burned and another six cars injured to a different extent. The cars were parked in an outdoor parking lot. save white countries. gas the Muzzies and Africans.